Richard Cavendish marks the anniversary of King James I's creation and proclamation of a union flag, on April 12th, 1606. When James VI of Scots rode south to London in 1603 to be crowned as James I of England, he called himself King of Great Britain. He hoped for a union of his two realms and tried to sell the idea to both the English and the Scots, without success. There were too many vested interests against him and the kingdoms remained separate as South Britain and North Britain. For a time their ships continued to fly their own 'jacks' to indicate their nationality: the jack being a small flag flown from the jack-staff at the vessel's bow. The English flew the cross of St George, their patron saint, and the Scots theirs of St Andrew. Unable to achieve the union of the kingdoms, King James found some consolation in the creation of a union flag and issued a proclamation about it in 1606. 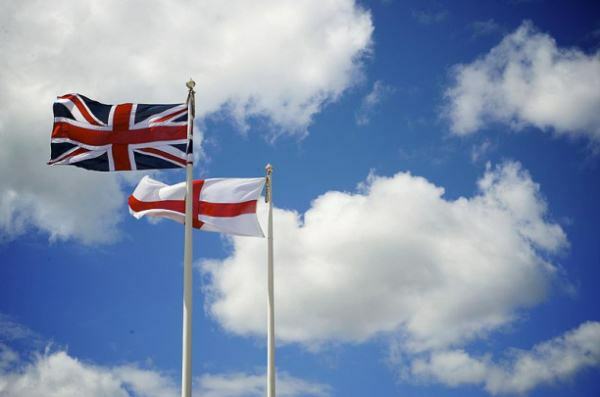 Devised by the royal heralds, the new flag combined the crosses of St George and St Andrew, and was to be flown from the top of the mainmast of all British ships. English ships would additionally fly their St George's cross at the top of the foremast, and Scottish ships their St Andrew's cross in the same way. In designing the new flag the heralds took the blue of the St Andrew's cross as the background colour with the white saltire on top of it. Super-imposed on top of that was the red cross of St George, whose original white background almost disappeared. It was reduced to a narrow white border or 'fimbriation', to prevent the red colour of the cross touching the blue background, which would have broken one of the arcane rules of the heralds' mystery. Some English seamen were not comfortable with the new flag, but it was used all through the reigns of James I and Charles I. The Commonwealth created a new ensign for English warships, which dropped the cross of St Andrew altogether and added a yellow harp for Ireland. In 1658 Oliver Cromwell as Lord Protector put out a Great Union flag, which combined the crosses of St George and St Andrew with the Irish harp. It was displayed at his funeral, but the restoration of Charles II also restored the Union Jack of James I, which continued in use until the formal union with Ireland in 1801 made it necessary to add the cross of St Patrick.